The mixed cereal-pulse crop known as mashlum. Decline after 1950 yet still grown in a few fields. 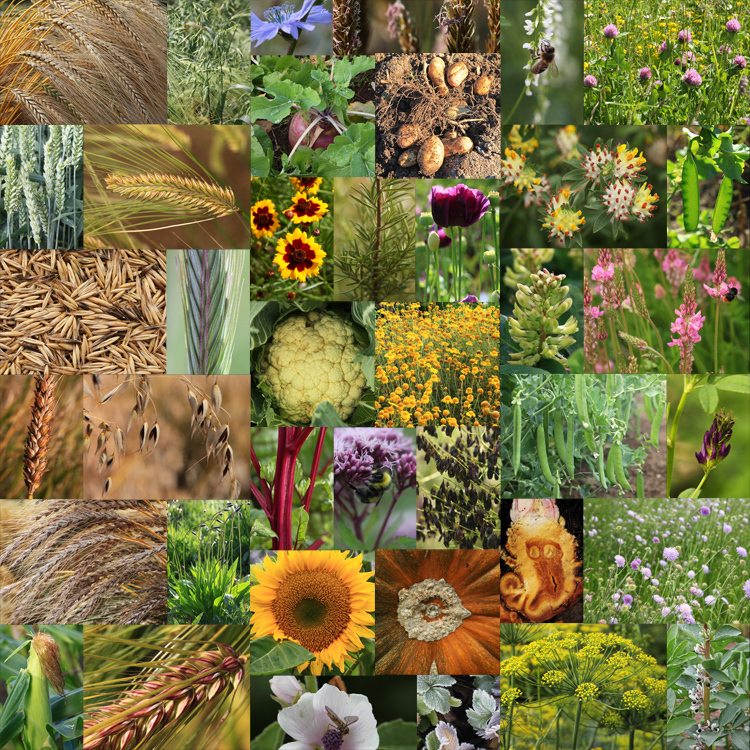 The question of crop mixtures in prehistory. An earlier article Mashlum – a traditional mix of oats and beans  suggested that the mixed cereal and pulse crop known as mashlum had died out in Scotland but no ….. an email from a farmer in Fife, Douglas Christie, confirmed that it was still grown on his farm. Here is a photograph. Earlier we had related an account from 1925  on the difficulties of growing mashlum and also the benefits. Mr Christie reports that the mixture worked very well, that chemical and nitrogen fertilizer costs were drastically reduced, but that he had to pick the field carefully as some weeds would be difficult to control. Since hearing from Douglas Christie, the Living Field has noticed on Twitter that several farmers in the south of the UK are also working with mixed cereal-pulse crops. A further question arose in correspondence as to their antiquity. That mashlum merited a separate chapter in the 1925 Farm Crops  shows how seriously it was taken. It first appeared in the agricultural census  under the heading ‘vetches, tares, beans, mashlum for fodder’ between 1902 and 1919. 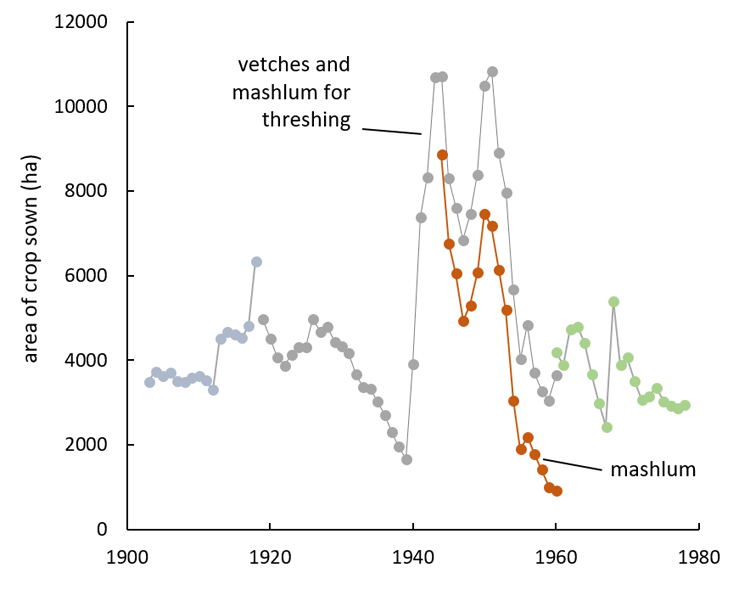 The category in the census then changed slightly to ‘vetches and mashlum for threshing’ which declined to a low point in 1939 (grey symbols in Fig. 1). Presumably the need for fixed nitrogen during shortages caused vetches and mashlum to increase in area almost 10 times during the war years. Most of this increase was in mashlum, which in the 1940s and early 1950s became the most widely grown legume crop in Scotland – covering more area than beans and peas – and was listed in the census simply as ‘mashlum for threshing’ (orange symbols in Fig. 1) , that is, grown and harvested for seed. After a few years, it declined again in the early 1950s and had almost died out by 1960. In 1961, mashlum disappeared from the census and any remaining fields were combined with ‘other crops for stockfeeding’ (green symbols to the right of the trace in Fig. 1). Fig. 1 The area sown with mashlum and related crops in the agricultural census in Scotland, 1902-1978 . Mashlum was listed as a separate item in the crop census from 1944 to 1960 (orange). Before that it was part of ‘vetches, tares, etc.’ up to 1919 (light blue-grey), then vetches and mashlum for threshing (grey). Any crops remaining after 1960 were counted as part of ‘other crops for stockfeeding’ (green symbols). The period from the late 1950s to the 1980s was the time of rapid increase in the use of mineral nitrogen fertiliser. The cereal-pulse mix became uneconomical. 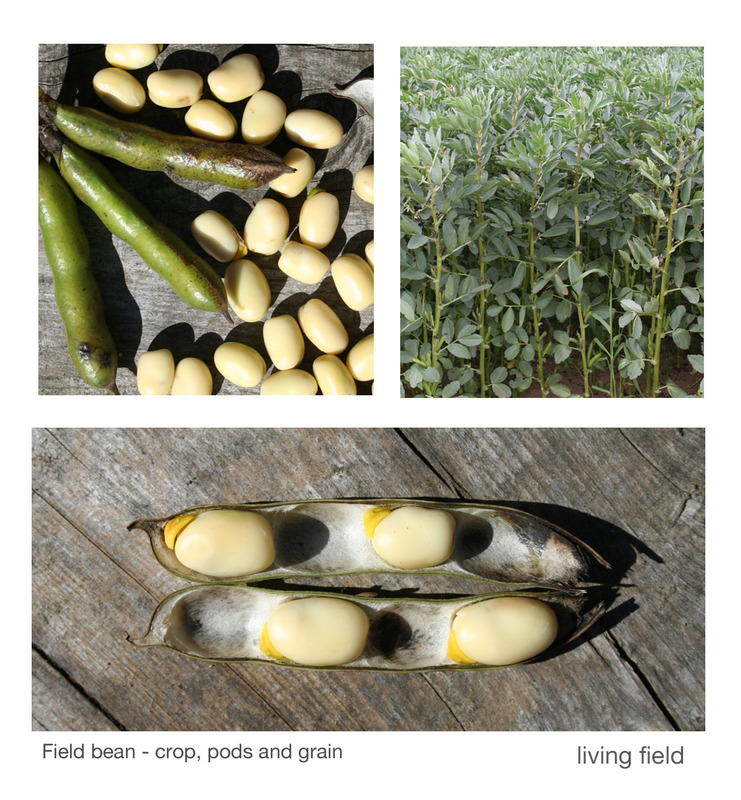 Despite its temporary revival in the 1940s, mashlum, as all other legume crops, was grown on a small part of the arable surface in the 20th century, generally less than 1% of it. A question then arises as to how old is the practice of sowing mixed cereals and pulses. The Dictionary of the Older Scottish Tongue (DOST) finds that mashlum, in the spelling mashloche, was in use more than 500 years ago , but that in itself tells little of the crop’s ancestry. 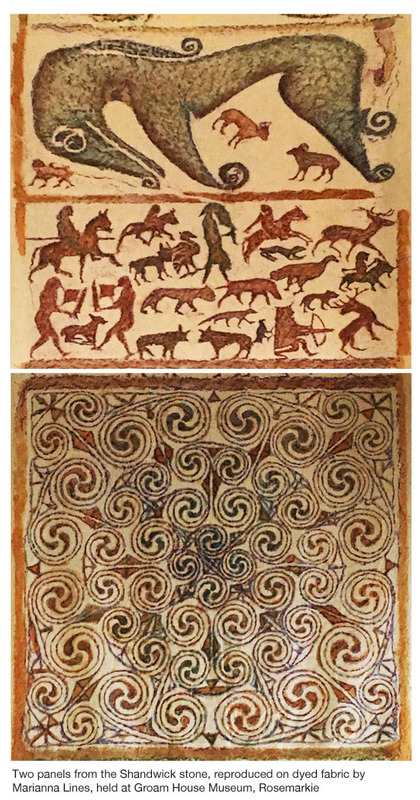 Was the method handed down from earlier Bronze or Iron Age farmers to the medieval period or was it brought over by the Romans or early Christians? The archaeological record in the north of Britain is thin on peas and beans: there is one record of field beans in Scotland – also known as horse bean and Celtic bean, now faba bean. Peas and beans appear far less frequently than cereal grains, but this difference is often attributed to the methods of cooking them: beans are less likely than grain to be charred and hence preserved. In an authoritative survey beans and cereals were examined in 75 locations in southern England . At some archaeological sites, beans and cereals, such as emmer wheat, are found together and in numbers that suggest they were both grown as crops for food. Descriptions of the finds at Foster’s Field, Sherborne in Dorset for example, include the line that beans ‘may have been grown as a mixed crop with barley or as part of a crop rotation system’ , a statement repeated in the broader survey . 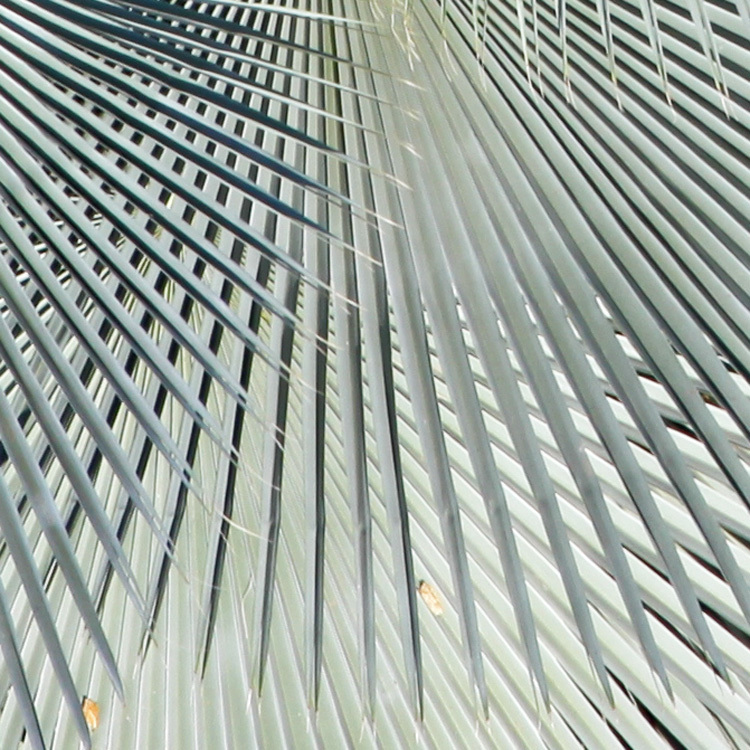 The archaeologists agree that presence itself does not mean anything definitive about how the crops were grown – whether alone, in broadcast mixtures, or in rotation or sequence. It is not hard to imagine, though, that cereal-pulse mixtures have been used from the earliest times. Imagine a household or village had some cereal and some legume seed, not enough to be sown alone, but together they would make a field. And the same farmers would have known, as all farmers up to the mid-1950s have known, that cereal and pulses together do better on poor soil than cereals alone because of the nitrogen-fixing ability of the pulses, and if the pulse is faba bean, then also the support offered by the stronger bean stem. Common sense tells that they would have grown mixtures but there is no definitive evidence. 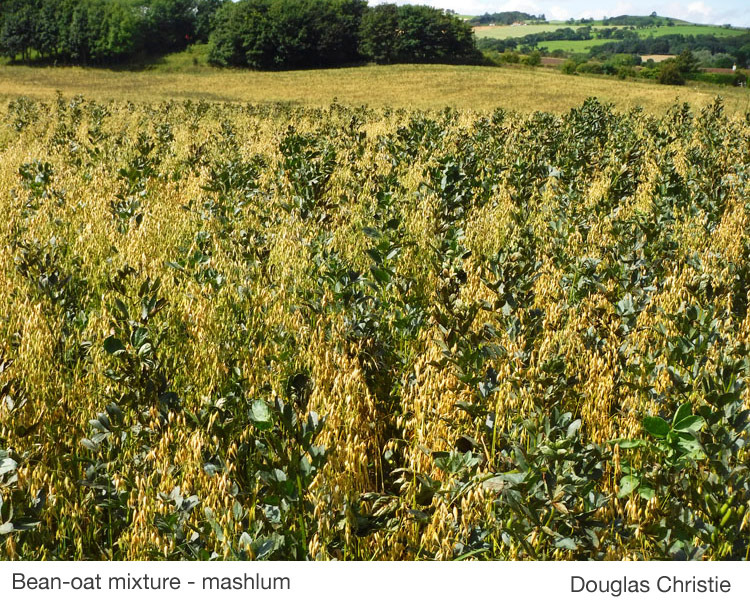 Mashlum – a traditional mix of oats and beans posed some questions about the crop grown as a sown mixture rather than a line intercrop. O’Brien DG. 1925. The Mashlum Crop. In: Farm Crops, edited by Paterson WM, pages 297-302, published by The Gresham Publishing Company, London. Crop census records for the main crops from early in the century to 1978 are available online as Agricultural Statistics Scotland from the Scottish Government web site at Historical Agricultural Statistics. Mashlum is sometimes included with other pulses and forages but is given as a separate crop for the period indicated in Fig. 1 above. DOST Dictionary of the Older Scottish Tongue cites the crop in the spelling mashloche from the 1440s at http://www.dsl.ac.uk/entry/dost/mashloche. Treasure ER, Church MJ (2017) Can’t find a pulse? 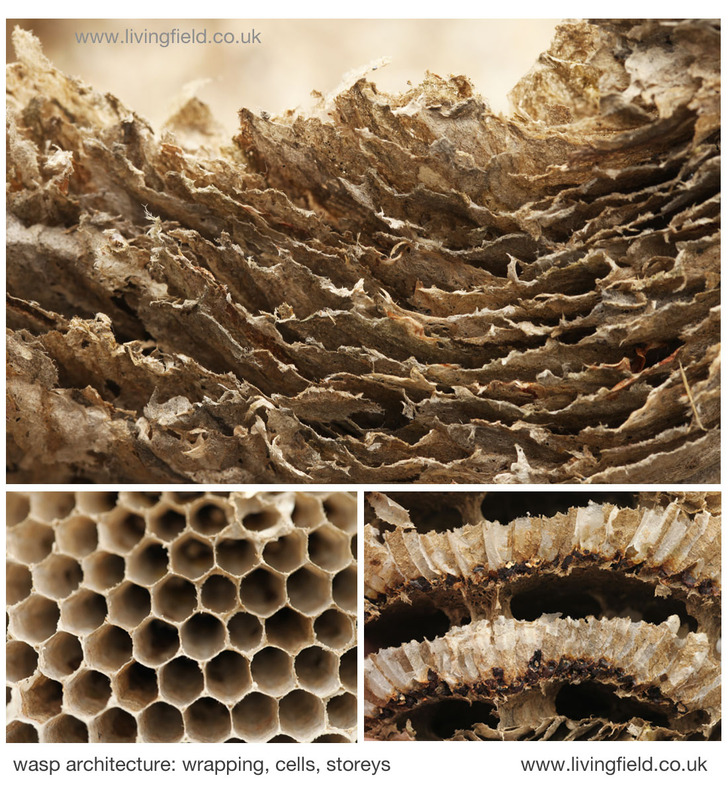 Celtic bean (Vicia faba L.) in British prehistory, Environmental Archaeology, 22:2, 113-127, DOI: 10.1080/14614103.2016.1153769. An excellent paper on the occurrence of field bean in Britain. Jones J. 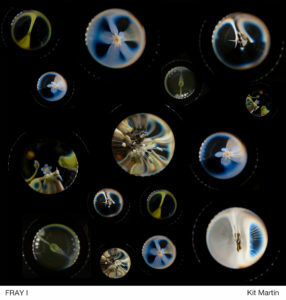 (2009) Plant macrofossils. In Best J, A Late Bronze Age Pottery Production Site and Settlement at Foster’s Field, Tinney’s Lane, Sherborne, Dorset. Archaeology Data Service 2009: idoi:10.5284/1000076. Many of the source papers on the topic are only available free to academic data services, but this one is available online through the link. With Dundee Science Centre, the James Hutton Institute is contributing to a range of outreach activities in 2016 as part of The Crunch, and initiative headed by the UK-wide Association of Science and Discovery Centres and supported by the Wellcome trust. 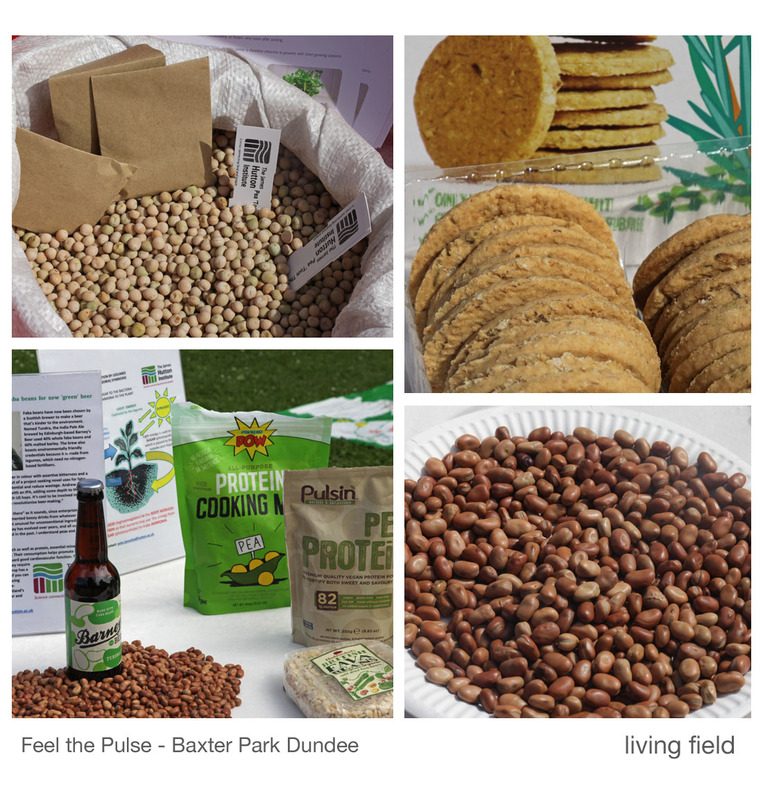 Our exhibit at a community-run event in Baxter Park Dundee on 28 July 2016 was called – Feel the Pulse – a display of beans and peas, which along with lentils are known as ‘pulses’ (images below). Why pulses? They yield a highly nutritious, plant protein that can be grown without nitrogen fertiliser because the plants themselves fix nitrogen gas from the air into their own bodies. Nitrogen is essential for plant growth, but in its mineral form (from bags of fertiliser) can be a serious pollutant, contaminating streams and drinking water. Once, peas and beans were widely grown and eaten, but the arrival of industrially made nitrogen fertiliser about 100 years ago and the ready import of plant protein from other countries caused pulses to decline as crops. Yet today, pulses are widely acclaimed for their benefits to health and the environment. The field bean Vicia faba crops above were grown locally without nitrogen fertiliser. 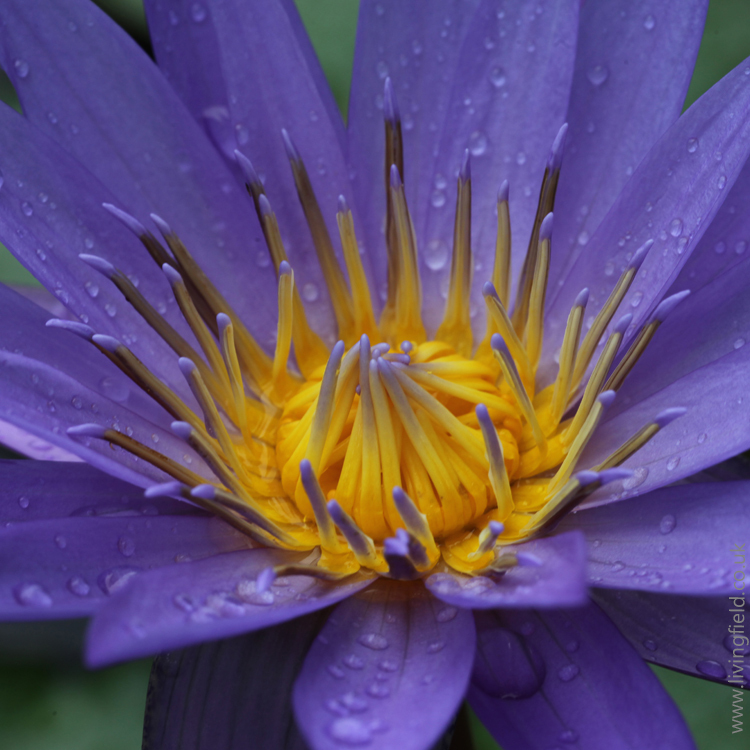 They also offered a habitat and refuge for insects and small animals. Is there a way to turn the tide – to farm more locally-grown cereal and legume produce, use less mineral N and support a cleaner environment. We believe there is but one of the first things to do is to increase awareness of the benefits of peas and beans and similar products. Our exhibit – Feel the Pulse – shows some of the things that are being done, such as finding types of peas and beans suited to the local conditions, comparing the nutritional value of different pulses and finding new pulse-based products for the market, for example bean bread and bean beer, both made from field bean flour. 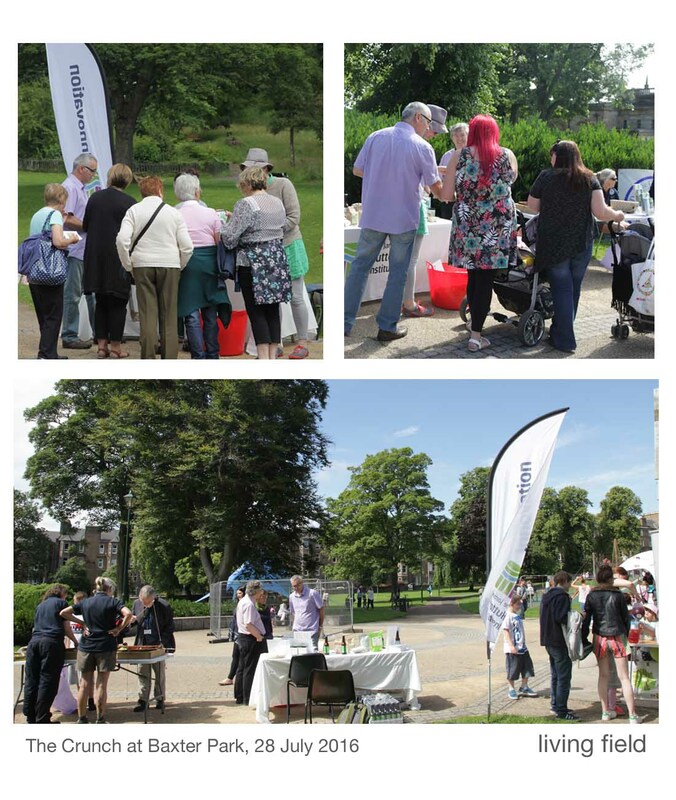 Feel the pulse at Picnic in the Park, Baxter Park Dundee, 28 July 2016. Part of The Crunch at Dundee Science Centre.